Balliol celebrated its 750th anniversary in 2013. A leading force in the University since about 1825, its fame has been international for well over a century. As a consequence of its antiquity and reputation, it has acquired outstandingly rich and varied Historic Collections comprising medieval manuscripts, many early and rare printed books, and notable holdings of modern literary, scientific and political papers, besides its own extensive archives. These collections span more than eight centuries, and are part of the National Heritage. 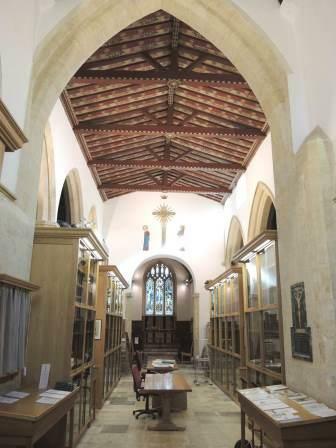 Following discussion with the Oxford Diocesan authorities, and enabled by initial generosity from The Shirley Foundation and others, in 2009 Balliol College acquired a 999 year lease and licence for St Cross Church Holywell, restored the Grade I listed building and converted it to an Historic Collections Centre, while preserving the Chancel for occasional services. The church was not deconsecrated and the chancel remains (technically) a chapel of ease to the University Church, St Mary's in the High Street. Planning for the project, headed by Dr John Jones for Balliol, involved research and recording of the stained glass and the memorials inside the Church and in the ancient Churchyard ; see links below. The main works began on 4 January 2010 and were completed a year later, and the collections were moved in during 2011. No burials were disturbed and no memorials moved. Full conservation work was undertaken on the building's structure and on the stained glass and painted ceilings. Access to the collections was suspended and the archivist's enquiry service limited during the moving period, January - September 2011. In fulfilment of the project's main objectives, the conditions in which the archives and manuscripts are kept are much improved, and they are more easily accessible to researchers than they were on the Broad Street site. Centuries of Balliol’s own administrative records, its mediaeval and early modern manuscript books, and its rich collection of C18-20 literary, personal and family archives, as well as some of the college's early printed books, are housed and made available in the Centre as of October 2011. The college archivist and curator of manuscripts is based full-time at St Cross, receiving and processing new accessions, arranging and describing the collections, assisting about 100 researchers in person each year and fielding about 1000 (mostly email) enquiries annually. For much of the time, St Cross is in use by individual researchers, who range from overseas academics reading medieval Latin manuscripts or investigating historical accounting to private individuals carrying out family history research. Throughout the year there are also numerous school and other group visits, classes and seminars using the archives and manuscripts, and workshops about handling and photographing archival materials and carrying out archival research. The building is open to the public several times each term for exhibitions and talks about current research in the collections, and anyone can make an appointment with the archivist to see the church at a specific time. Hundreds of people visit each year during the Oxford Open Doors weekend in September, for which a special exhibition is always prepared. Frequently asked questions about the church building, the conversion project, and the collections.